Okay! Are you ready for today’s Perfect Picture Book selection? Suitable For: ages listed variously as Preschool – Grade 4, and ages 5 and up. I would go with 5 and up – I think some of the humor might fly over the heads of the littlest ones. Why I Like This Book: SO FUNNY! Every letter is for musk ox except the odd one here and there… P is for Wolf, T is for headache, (you’ll just have to read it to follow that logic!) and my favorite, M is for apple… because he feels bad about eating it at the beginning 🙂 Musk ox is just a bit pushy in his insistence, and in the end gets his comeuppance, which is just a bit fair 🙂 This book may not be terribly helpful in teaching the alphabet, but it’s sure to tickle the funny bone. The art is particularly hilarious. Now then, please don’t keel over with shock, but that is the end of today’s post. I KNOW! So brief! But the truth is, I’m under the gun to get all the details squared away for my new writing course after the announcement leaked out a little ahead of schedule last week – nose to the grindstone and all that – and you know how me and technology get along… we DON’T… so enough said! Wish me luck with my email template! Have a great weekend, everyone! And PPBF bloggers, please put your post-specific links in the list below – I can’t wait to see what you picked this week! Oh Susanna – What Is The Difference Between A Hook And A Pitch? Ohhh, such a nice feeling after clicking “submit” and a sign comes up saying your link has been submitted….Yay!!! …lol. What only 15 days till Groundhog Day, gosh has time flown.. 🙂 Love your hilarious alphabet book. Just as well he can't eat all the letters, otherwise we wouldn't have any to make words, to make sentences, to make stories…lol. Nice one Susanna! Off to look for some good jokes then, can't have Phyllis lonely. 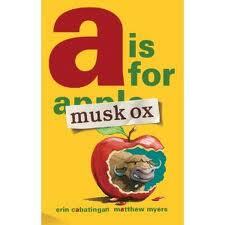 I've heard of tbe musk ox book, it sounds hilarious!!! Is this the same Zebra from “Z is for MOOSE!”? I want to read both books! I'm delighted to hear that the ZEBRA got the last laugh. Zebras rock. This sounds like a must-read. I like the humorous twist. I checked out 'Phyllis' from the library and read to my grands. They were upset that I didn't still have it with me on Wedn., but alas, it is a 'holiday' book and can only be out for a week. Blessings on your email template. I've heard about this book. Looks like a great laugh for kids and their parents. Congratulations on your writing course. I've been sooo busy with a freelance project, that I haven't had time to comment. Seems like Phyllis should have some kind of celebration for her special day coming up! I have this on my reading list!!! I want to read it so bad! My library doesn't have it yet, so I may have to pony up for the old musk ox. After reading your review, I'm sure it would be worth it. 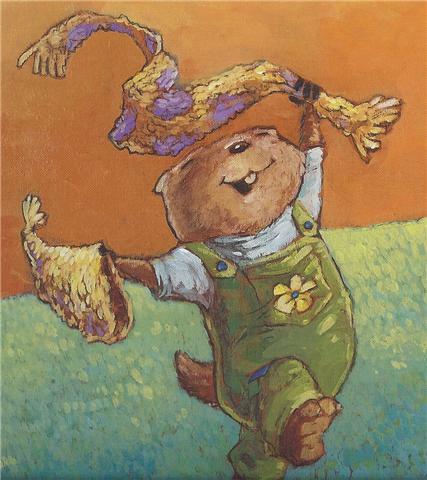 Bye…going to say “Hi” to a certain little marmot! Sounds like this is one we are going to have to read to see what happens. It's amazing all the different ways authors come up with to write an alphabet book. LOVE the sound of your funny book, Susanna. I love funny. I'll be sure to check it out. This one sounds really, really cute. Thanks for the heads up. I love your PPBF pick…it looks hilarious…and I agree that the humor looks a little mature for the very little ones. Finally gave away the last book mark – and Phyllis just happened to come up too, so I may have to go back to that bunch of first graders with some World Tour photos! And I am not surprised at the memory problems of that musk ox, I know where he's coming from! Great pick Susanna! I love the sound of that book already! I adore absurdity and humor that isn't straightforward. I wish my kid were still little so I could read this to them over and over (I feel a little odd reading it to myself over and over…but oh well, if it has to come to that…LOL!). Best of luck with getting everything done and ready for your course; I can't wait to take it next year! Hope your Friday is good and have a great weekend, Susanna! A is not for musk ox. Anybody knows A is for Cupcake!! I love apples! Cool book! And apparently they love to appear in alphabet books! As Erik pointed out, both Z is for Moose and this one have a zebra as a major character! Can't believe Groundhog Day has snuck (is that a word?) up on us. I'll need to check out Phyllis's site! And I can't wait for your course…just have to figure out when I have a block of time to take it. Hope all goes well for you, Susanna. I love this book and I haven't even read it, yet! I hope our little library has a copy. Good luck getting your writing course on order. I'm sure it will be fantastic! Sometimes we just need to laugh. This sounds like a really great book for kids. I was just tickled by the cover. The clever things author's come up with. I thought about groundhog day a few days ago and realized I'll celebrate it in NYC. Hope you post it again, after all it is a tradition! What a fun sounding book! Definitely sounds as if it would be best for kids who already know the alphabet, to both reduce confusion and to add to their appreciation of the funniness of turning the alphabet inside out and upside down. I can't believe I forgot to add my link this morning! That's usually one of my first tasks on a Friday morning. Thank goodness Laura reminded me! The cover is fun! You can stick your fingers right through it! 🙂 Groundhog Day will be a new experience for me this year – I'll be reading Phyllis on a web radio story time show! It probably wouldn't hurt any of us writers to have a little refresher course in the alphabet. After all, it is a building block of our trade. Just sayin'… 🙂 I hope you get to read this book at least once, Teresa – it's pretty funny 🙂 Thanks for the good wishes and have a great weekend! before and I should've remembered to search both ways! I'm soooo excited! Oh…and give Phyllis a hug! It really is, isn't it, Janet? And they're so good that when you read them they make you say, gosh, why didn't I think of that?!!! oh, good! let me know if you like it 🙂 Phyllis sends you a warm and furry groundhog hug back and hope you will excuse the fact that she has not bathed recently because it is very VERY cold! back online this evening and this time I put in Erin Cabatingan instead of the title and it showed up. That has happened before and I should've remembered to search both ways! I'm soooo excited! I'll have to get on facebook so I can visit Phyllis. Who would have thought musk ox starts with “a”? I love this, so funny. My kids will love it. Thanks for sharing! What is a musk ox? This looks a blast – super choice and a great one to read with M is for Moose. I've missed Phyllis! And Phyllis has missed you… and your red motorbike of which she has many fond memories! Perhaps we need to think up a reason for another World Tour 🙂 I hope you get to read this book – it's a hoot! I've seen the title of this books, but didn't understand the concept until your review. Thanks for reviewing it. And it's nice to see my favorite Groundhog!